Amentotaxus argotaenia, as described in 1916 by Robert Knud Friedrich Pilger (1876–1953), in Botanische Jahrbücher für Systematik, Pflanzengeschichte und Pflanzengeographie, 54th edition is commonly known as Chinese flowering, or Northern catkin-yew; as well as 穗花杉 (sui hua shan) in the Chinese language; and sam hoa bong in Vietnamese. This species name translates from Latin into "silver tape," probably referring to the bold bands of stomata on the undersides of the needles. Description. Northern catkin-yew is a shrubby, evergreen, coniferous species of tree in the Taxaceae family. Mature plants will measure to 7 to 24 feet (2 - 7 m) tall, with a trunk up to 8 inches (20 cm) in diameter, measured at breast height. Branches grow spreading to ascending forming a rounded crown. Bark is reddish at first, weathering over time to light or dark gray. Branchlets are light olive-green in color. Leaves measure 1.2 to 4.4 inches (3 - 11 cm) long by 0.24 to 0.44 inch (6 - 11 mm) wide, with leathery texture. Needles grow straight, spreading slightly forwards, with 2 white stomatal bands below nearly as broad as the marginal bands. Apex is bluntly acute or obtuse. Pollen cones develop in groups of 1 to 3 at tips of branchlets. They measure 2 to 2.4 inches (5 - 6 cm) long, with 2 to 5 pollen sacs. Seed cones are ovoid or somewhat globose shaped, colored light olive-green at first, Individual cones measure 0.8 to 1 inch (2 - 2.5 cm) long by 0.52 inch (1.3 cm) wide. Seeds measure up to 0.52 inch (1.3 cm) long. Distribution. This species is native to mainland China, found in Fujian, southern Gansu, Guangdong, Guangxi, Guizhou, western Hubei, Hunan, Jiangsu, north-western Jiangxi, central and south-eastern Sichuan, south-eastern Tibet and southern Zhejiang provinces. It also occurs in Taiwan. In Hong Kong, it is distributed in Ma On Shan, Tai Mo Shan, Mount Parker, Sunset Peak, Lantau Peak, and Sai Kung. 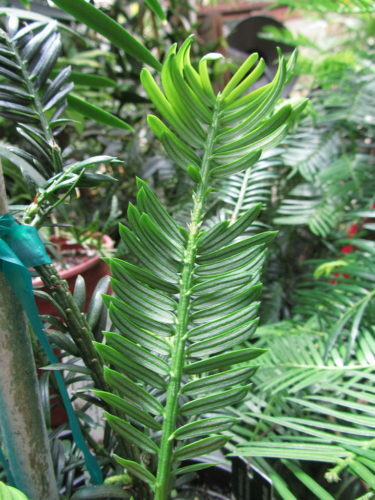 In the Shing Mun Arboretum, a living specimen is displayed. Outside China, it occurs in northern Vietnam. Its preferred environment is limestone mountains, forests, ravines, shady and damp stream banks; at elevations of 1,000 to 3,500 feet (300 - 1,100 m) above sea level. Hardy to USDA Zone 9, cold hardiness limit between 20° and 30°F (-6.6° and -1.1°C). 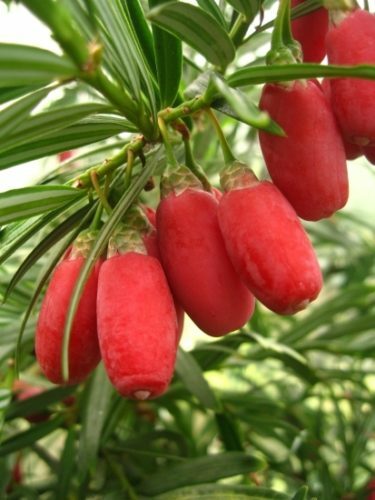 The status of the species is not good as the growth rate of the plant is slow and its regeneration is infrequent. Its seeds are poorly dispersed and predated by rats. The declining of the population is also caused by forest clearing and habitat modification. In Hong Kong, this species is under protection based on Forestry Regulations Cap. 96A. All the localities of the species occurrence are within Country Parks under protection. Tai Mo Shan Montane Scrub Forest in the upper Shing Mun Valley was assigned as a Sites of Special Scientific Interest (SSSI) in 1975 as the forest supports this rare species and other species, Camellia granthamiana, Camellia waldenae, and many species of orchids. Attribution from: J. Silba; An international census of the Coniferae. Phytologia memoir no. 8; ©1986, H.N. Moldenke and A.L. Moldenke, Corvallis, OR. Amentotaxus argotaenia — a closeup of foliage detailing the stomata on the abaxial aspect. 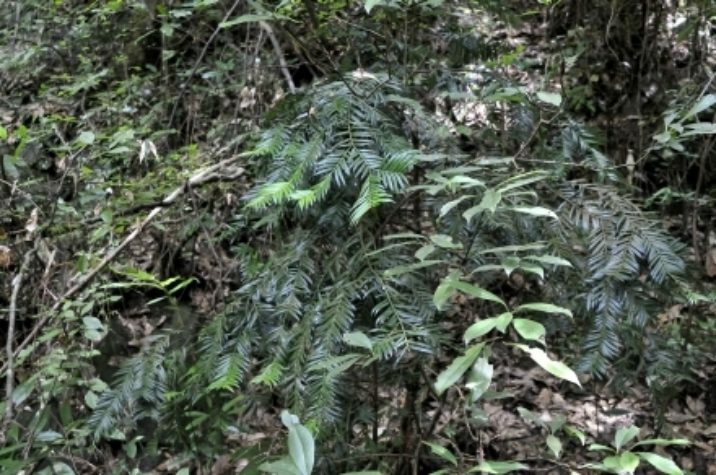 Amentotaxus argotaenia — a tree growing in nature in China. Photo by P Thomas, 2016. Amentotaxus argotaenia, from the website, Threatened Conifers of The World (http://threatenedconifers.rbge.org.uk/taxa/details/1127). Downloaded on 2 November 2018. Amentotaxus argotaenia — a closeup of mature seed cones.